But when it snows during the day...I don't know how to deal with the constant onslaught. It's like someone hitting me in the face over and over again saying, "You will never seen the sun ever again for the rest of forever." You can deal with that once, sure. But for hours at a time? I'm not so patient. I live on a very quiet neighborhood road. It's pretty much the last road to get plowed in the entire valley. And I live on top of a hill. So there's really no where to go, unless I prefer not ever coming home again. And as it turns out...I'm a little partial to that electric blanket stashed so elegantly on the couch. So I stay inside with my children until I lose my ever loving mind and agree that the very best thing we could do in the whole wide world is to go outside and play. In the snow. All of us. Including the children. It actually seems quite marvelous at first. I mean...they will go frolic in the cotton mounds of snow and build the snowman (or queen or princess or spaceship) of their dreams while I watch from the side smiling to myself at how amusing it is to see my children experiencing the magic of a snow-covered wonderland. They will gradually tire of their winter adventure and we will calmly retire back inside where they will sip hot cocoa under blankets until they fall asleep...all tuckered out from playing so happily. It takes an hour just to GET THEM OUT THE DOOR. No one knows where their coats are. I mean...it's been at least 12 minutes since they last saw them...they could be in China by now for all we know. It turns out, one of the coats is under a bed, one is in the bathroom, one is on the stairs, and weirdly...one of them is hanging right where it should be. I fail miserably in trying to convince my Little P that she will freeze in exactly 4.5 seconds, so I have to resort to dressing her in every pair of pants she owns before squeezing her into snow pants that are now a little too snug. And do not even get me started on the mittens and gloves situation. It's like watching them hunt for Easter Eggs. They can walk past it nine times and still not see it. And then when they finally get out the door, the youngest two immediately take off their mittens and very nearly get frostbite just from looking at the snow and their bare hands at the same time. So of course they need NEW mittens. But also, of course, they somehow managed to completely cover themselves in snow in the 3 seconds they were outside and they are determined to re-create the Great Lakes in my living room as they trudge back in to demand new gloves that actually work. And just as I'm about to lose my ever-loving-mind...some guy comes barreling up to my children offering them "candy" and "sled-rides" in exchange for love and kisses. And thank goodness it's their father because that would be super creepy if it was anyone else. And since they are CLEARLY doing just fine without me....I slip back inside and take a nap. Just kidding. I made cookies. 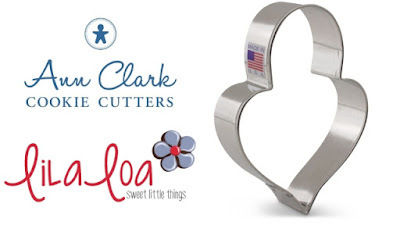 I also spent some quality time with my new cutters from The LilaLoa Collection for Ann Clark Cookie Cutters. And now that I've used them for their intended purposes...I can't wait to start using them in all the other possible ways!! 1. My son is convinced this is actually a pointed mushroom cutter. I actually think it would make a cute Love Potion bottle too! Either way...bake some cookies. 2. 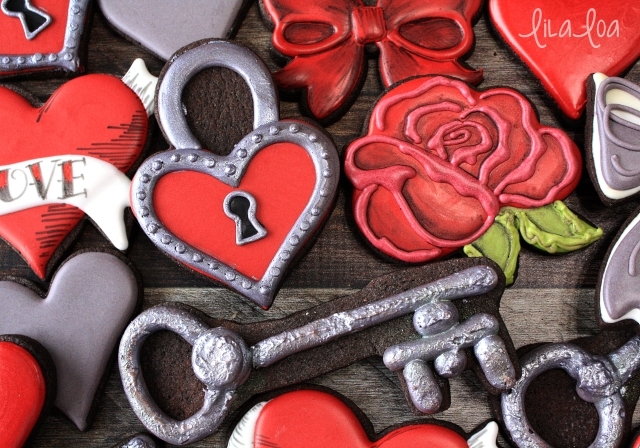 Outline and fill the heart area of the cookie with medium consistency red icing and a #3 tip. Immediately add a keyhole with medium consistency black icing and a #1.5 tip. Let it dry until the surface has crusted over. 3. Add the shackle with a medium consistency gray icing and a #3 tip. Let it dry for 15 minutes. 4. 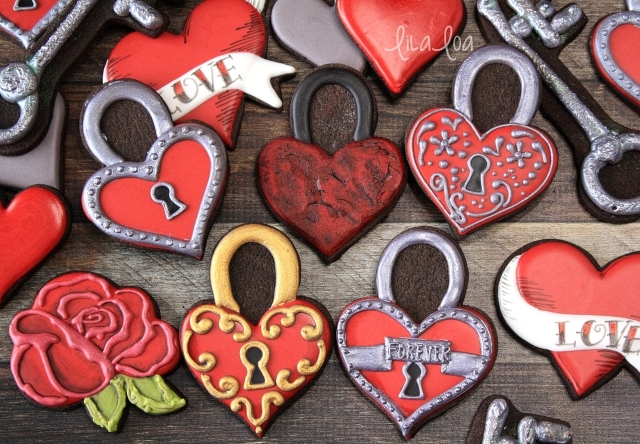 With the same gray icing, and a frame around the heart. Let it dry for a couple of hours. 5. 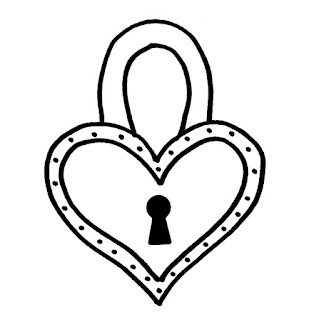 Grab some thick gray icing and a #1.5 tip and outline the keyhole. Pipe dots all around the edge to look like rivets. Thick icing always has peaks when you pipe dots. Use the flat end of a 2-in-1 tool to smooth the peaks. 6. Paint all the gray icing with your favorite silver. I like to mix silver luster dust with silver airbrush coloring. But you can do what you want. There are so many different ways you could decorate this cookie. 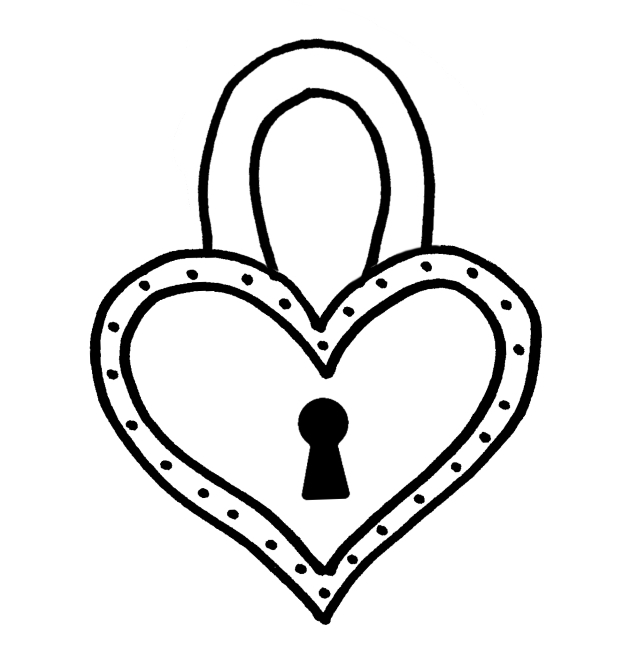 I'm kind of loving the "broken" heart padlock without the keyhole. What about you? Grab the cutters -- Heart Padlock, Rose, Banner Heart, Key, Tattoo Bow, Tattoo Banner 1, and Tattoo Banner 2. 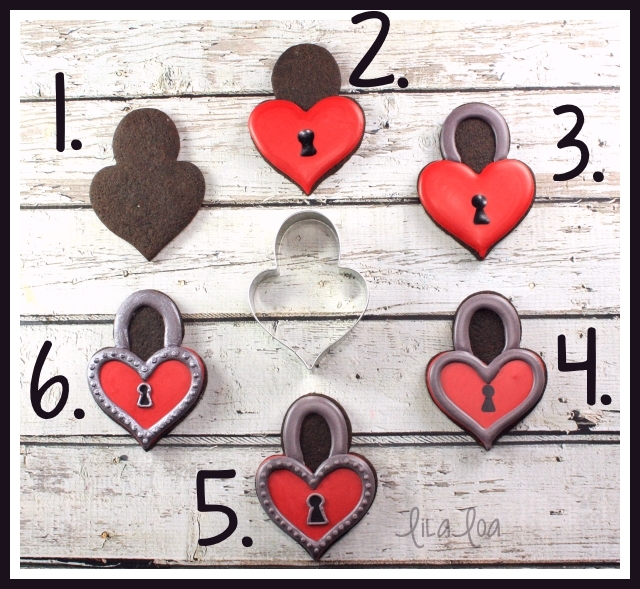 See how I made the BANNER HEART cookies. Grab the ROSE cookie tutorial. 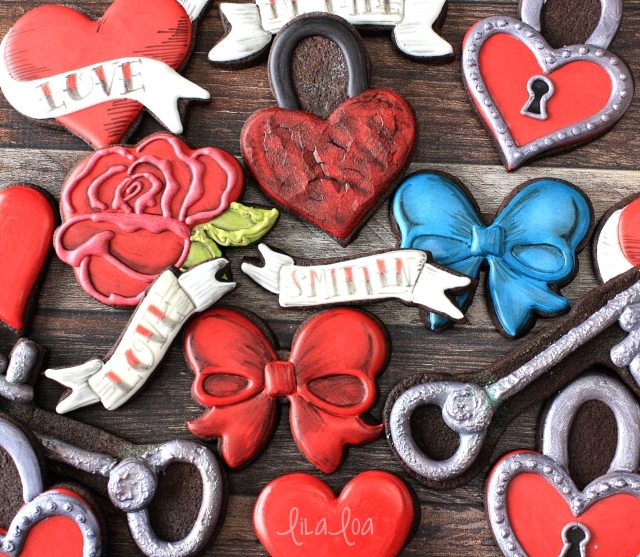 Learn how I make ANTIQUE METAL KEY cookies.